Shannon Cole HAS to play now. Cole, Elrich, Appiah-Kubi, Minniecon please. Shannon was common in the youth league game against Heart on Sunday. Cole and Elrich for who? Signed a new contract today. 1 year deal. What was up with Shannon Cole pre-match yesterday? Couldn't hear what the ground announcer was saying when they had his photo on the giant screen. I'm pretty sure they do it every week as like a "player to watch" thing with different players and it was his turn... Which was weird because he didn't play... And particularly weird because the speakers over the RBB were patchy for the whole pre-game, and off for his whole segment. It was a 'player sponsorship'. In this case it was some model agency. There was a twitter post or news item or something I saw, a bunch of models from the company came out to the game. congrats to the big fella for getting married today. Wonder if he is getting any time off for his honeymoon? maybe popa has shouted him a free trip to gosford. Would a better present be a starting spot in the side? Outstanding highlights package of Shannon, how confident is he crossing with either foot? I always prefer him playing on the right, but I agree let him take a set piece and hope he scores just to see him do the celebration. I still love his nickname for Shinji....tense eyes. Some of us oldies don't use facebook. Link? 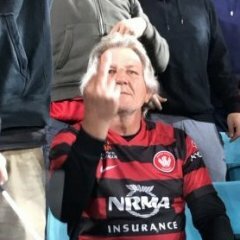 Shannon gives the RBB and WSW supporters a big wrap in this interview with Zdrilla. Cole must have hurt himself at training, he's out with a quad injury for this weekends match against Newcastle. Signed an contract extension. deets tomorrow. I like Cole. He cops it a bit. Unfairly IMO. Always puts in and works hard. I don't really rate the guy as a player, would rather we had let him go TBH. cole is a very handy squad player imo. two footed, can cover multiple positions and will jag a couple of goals a year from set pieces. works hard and seems a good team mate. perfect 14th or 15th man.